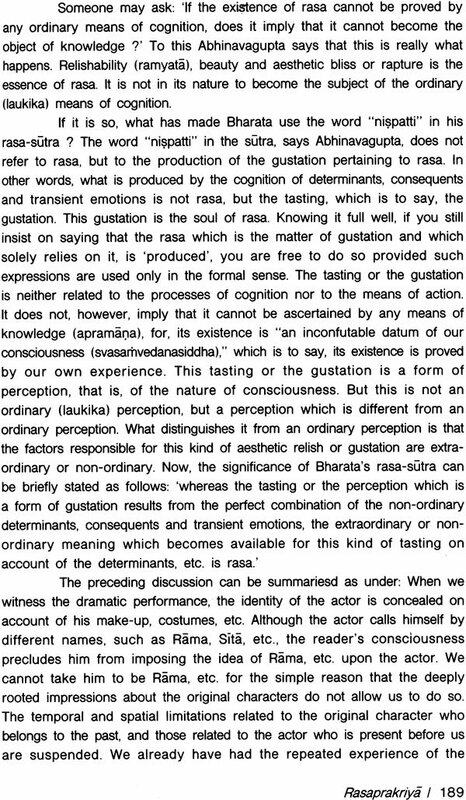 A student of literary aesthetics has to be both a literary critic and a rasika, an ardentfan. Otherwise his studies are bound to be dry, academic exercises. Dr. Deshpande had a sharp critical faculty combined with a poetic sensibility. 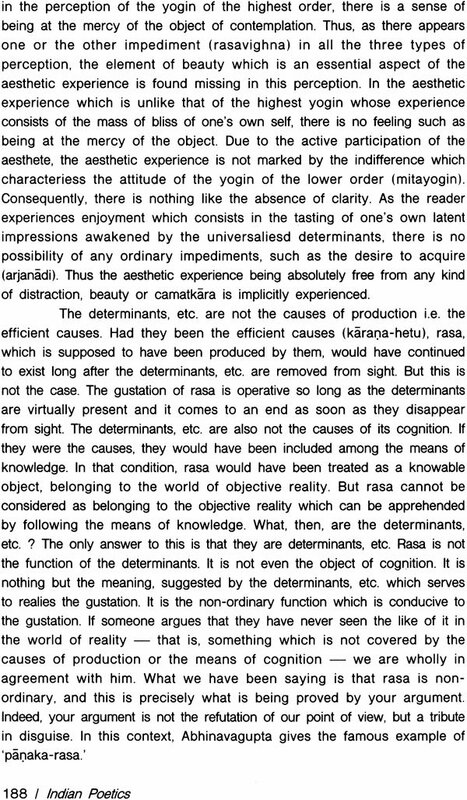 He was also a master of classical Sanskrit philosophy, aesthetics and literature. This gives his analysis a depth and an innovation which will delight the reader. His acclaimed works have never bored readers with rhetoric but invited readers on a journey of discovery. Since literature holds up a mirror to society it is natural that strands of spirituality, philosophy and other disciplines get entwined in a critical study of literary aesthetics. A holistic approach for studying this ancient art cannot be ignored. For example when studying concepts like Alankar Rosa or Dhwani one can only arrive at their real meaning by tracing their historical development through two thousand years. Because the same concepts have meant different things at different times. Most studies have been lacking in such approach and this book hopes to fill that gap. This book deals with the different schools of thought poetics and concepts. These concepts very relevant contemporary studies in literature. 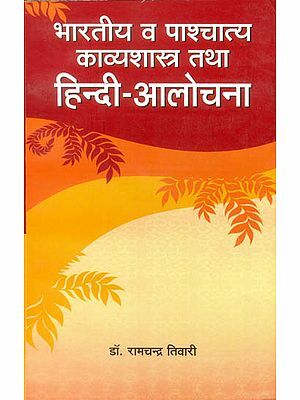 This work so far available in Marathi and its Hindi translation has now been made available in English by the painstaking efforts of Prof. Jayant Paranjpe. G.T Deshpande (1910-1989) Sanskrit scholar and critic Ganesh Trayambak Deshpande was born in Vadner Gangayee in the Vidarbha region of Maharashtra. He studied in Amravati and Nagpur doing his BA. and L.L.B. After getting his law degree he went on to practice law but a lifelong fascination with Sanskrit pushed him into pursuing the subject seriously. He retired as Professor and Head of the Department of Sanskrit in Nagpur University. A prolific writer, he wrote many articles and books which won critical acclaim like Kriyatarjuniyam, Alankar Pradeep, Abhinavagupta and Sankhya Karika. He won the Sahitya Akademi award in 1959 for Bharatiye Sahitya Shastra, a treatise on Indian Poetics. Dr. Jayant Paranjpe (1945-2002) was Professor and Head of the Department of English, Nagpur University. He obtained his Ph.D. for his study of Faulkner’s major fiction from the point of view of Oriental Aesthetics in Sanskrit. He was awarded. D. Lift for his pioneering Marathi books Shri Na Pendase Hastallkhite & Parishkarne and Grace ani Durbodhta. Dr. J. B. Paranjpe has published widely in English and Marathi including a novel Aarth Kaya Andharla and a collection of poems Paulkhuna. His recent publication Critical Investigation dwells on several problems in the field of criticism and literary theories. Dr. Paranjpe translated Bharatiya Sahityashatra into English to provide wider access to scholars and researchers of this classic. Bharat,jrn Sahityasastra was first published in Marathi in 1958. The second edition was brought out in 1963 and the third in 1980. Since the third edition contains all the authorial corrections and revisions the present work is based on it. Soon after the first publication, the book began to draw the attention of scholars; it earned the author a D. Lift, and subsequently a Sahitya Akademi Award. Recognition came rather slowly and gradually, but it was firm and assured. Even those whc held different opinions were impressed by the persuasive argument and erudition. Himself a student and teacher of Law, he made an excellent case out of the diverse material that he had unearthed during the course of his research Every single statement was substantiated. What was so remarkable about the whole book was the catholicity of the approach and the gentle tone of its author. The author had surveyed the whole terrain covering the time-span of about 2000 years and called passages with a remarkable insight. The purpose was at once simple and ambitious. 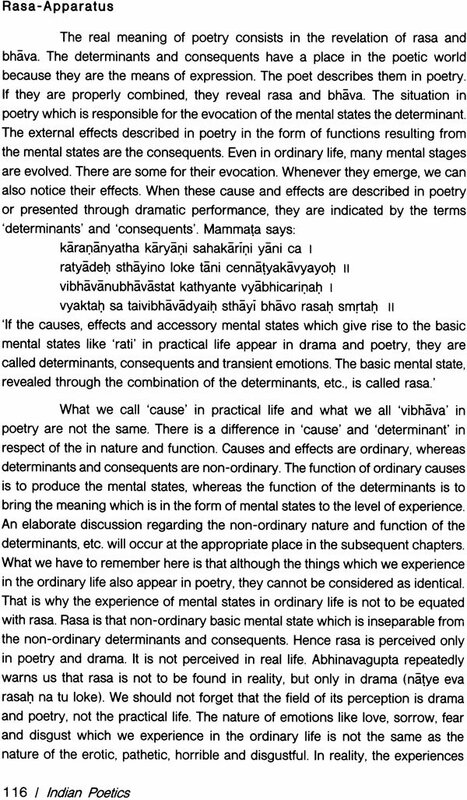 He wanted to lay bare the whole scheme of poetics in Sanskrit as it evolved through successive periods of transition by establishing proper connections, It was like reconstructing an ancient monument which suffered erosion due to ravages of time. Dr. Deshpande succeeded in doing what he had set out to do. I first read this work in the sixties when I was doing my graduation. It is difficult to say how many times I have turned to it in the later years. 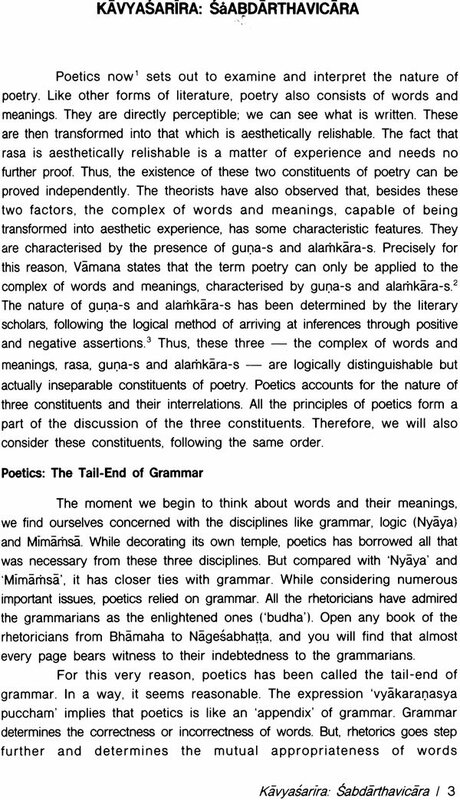 Now there exists a considerable body of literature on Sanskrit poetics written in English. Dr. P. V. Kane, Dr. K. C. Pandey. Dr. S. K. Dey, Dr. V. Raghavan, Dr. Sankaran, Dr. Lahiri, Dr. M V. Patwardhan, Eeinori Gnoli, Dr. J. L. Mason and many more have done commendable work inenriching our understanding of the aesthetic theories in Sanskrit. Some more works were added to it even after 1958. 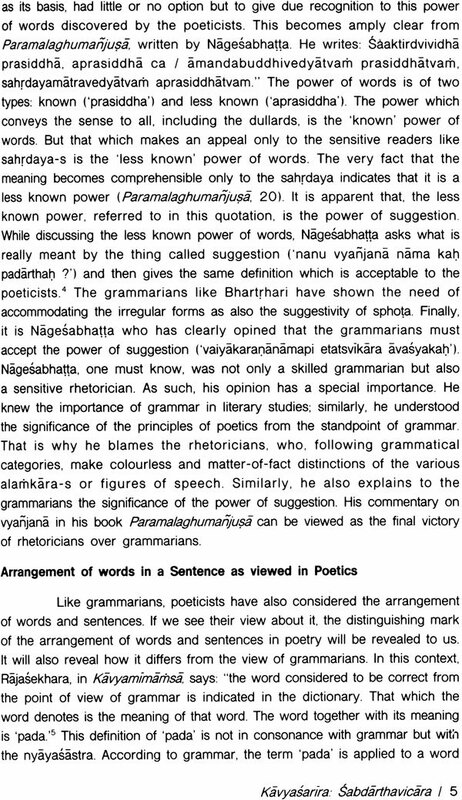 However, the works in English added after 1958 scarcely refer to Bharatya Sahityasastra. 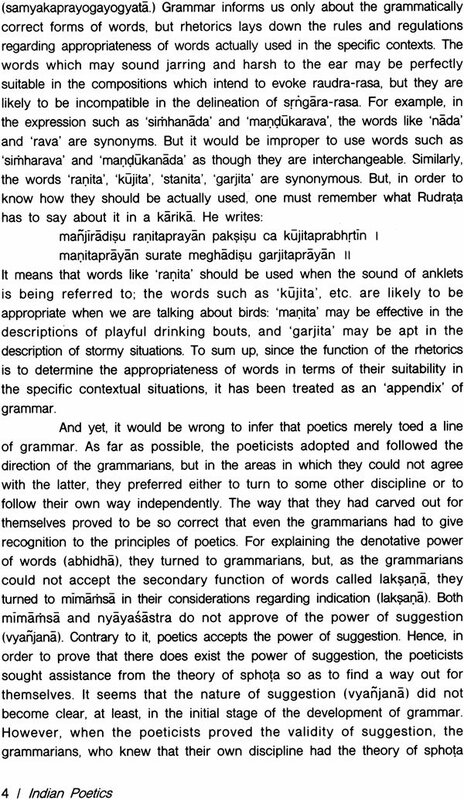 The obvious reason, it seems to me, is that the work is in Marathi, and as such, scholars do not have a ready access to it. This is what encouraged me to venture the task of translating it into English. Being basically a student of literatures in English and Marathi. I never thought that I could do real justice to the task that I have undertaken. However, all these years, I had an indefinable sense of obligation towards this work. That is what worked as a motivating factor in undertaking the work of translation No wonder I should feel happy about whatever little could do. 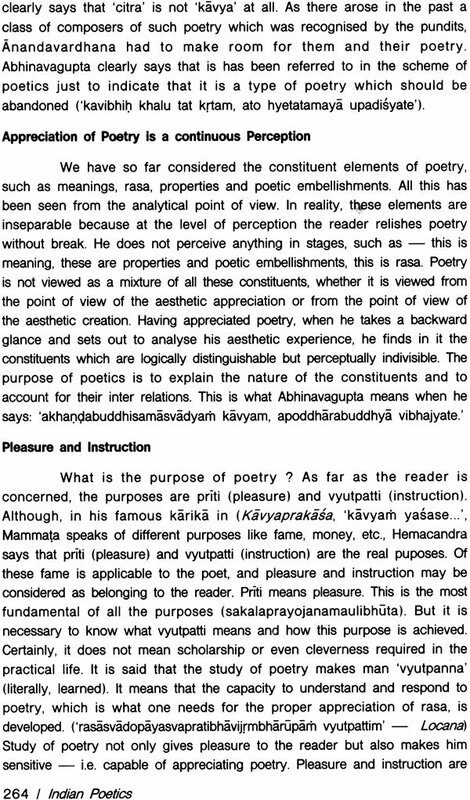 In the concluding paragraph of the book, Dr. Deshpande says that his work should serve as an introduction to study of poetics in Sanskrit. However, one who has gone through the pages of this work may at once realise that it is far more than a mere introduction. It provides us with a perspective to study the various problems concerning literature. 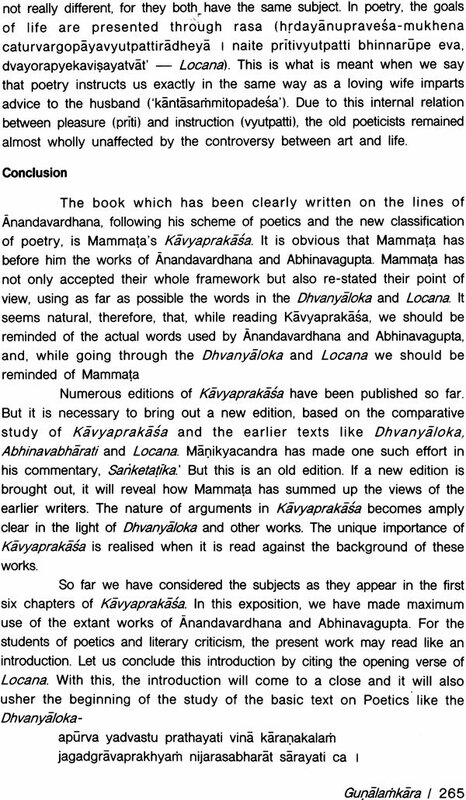 While translating this work, I had in mind two types of readers: 1) the students of Sanskrit Poetics, and 2) all those who are interested in the study of literary criticism as an independent discipline. The first set of readers will not only find in it all that they already know but also the perspective to view poetics in its totality. The second set will be introduced to the theoretical formulations of the scheme of oriental poetics. Besides this they may have a better insight into some of the contemporary issues that are being discussed in our own time. For instance, we are likely to benefitted by the insights of ancient poeticists In ‘re-viewing’ the nature of relationship between Linguistics and Literary Criticism. As the work has been translated with these two types of readers in mind, I have followed the original theories rather closely but not literally. Those who are familiar with the oriental theories in Sanskrit will not have any problem with technical terms being used in the text. But the students of the second type are likely to feel slightly perplexed by the host of new concepts with which they may not be acquainted, or by the seemingly familiar terms used with different connotations. To them, some of these terms may sound un-English. Although much work in English has been done by well-known scholars, we have not as yet got over the problem of technical terms. Consequently, we may find a number of terms translated differently by different writers. In the absence of standardisation in the area, the usual practice is to provide a glossary of important critical terms. The same practice is followed in the present translation. Bharatiya’a Sahityasastra is originally divided into two parts. 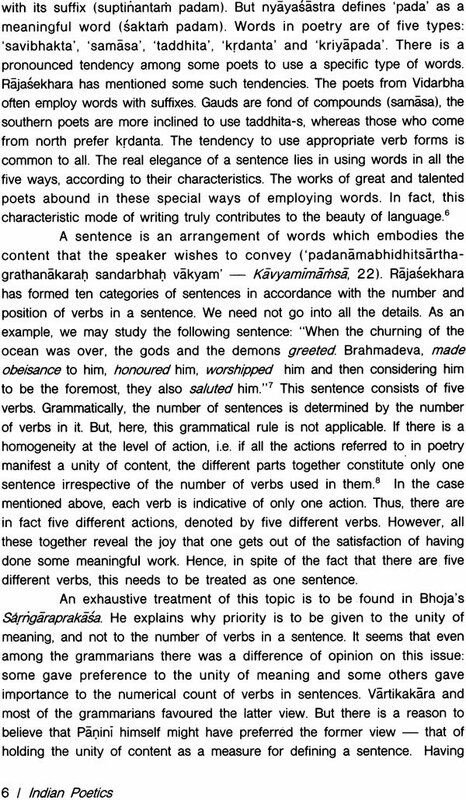 The first deals with the development of Sanskrit poetics from Bharata of Jagannatha. 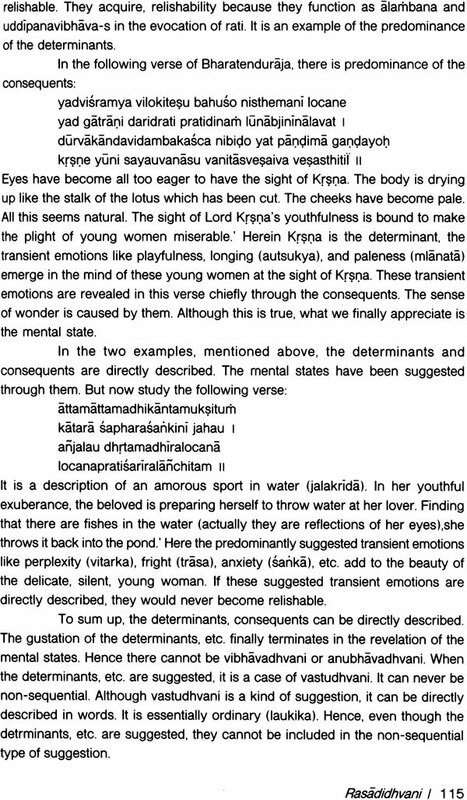 In tracing the evolutionary development of critical thought in Sanskrit covering a period of about 2000 years (i.e. from 200 AD. to 1700 A. Di, the author has adopted the historical method. In the second half, he is mainly concerned with the issues of the theoretical nature. 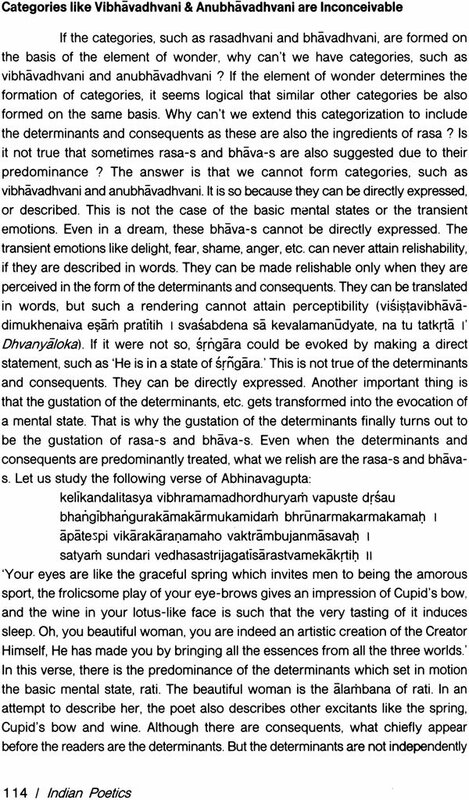 The method adopted is the same as it is found in the basic critical texts, such as Kavyaprakasa. In thin following pages, the readers will find the translation of the second half of the original work, The work consists of nineteen chapters. divided into two halves: the first half consisting of the first eight chapters and the second half comprising the remaining ten chapters. Besides all the ten chapters in the second half, I have also translated Chapter VIII (titled ‘Pre-Chapter’), which briefly sums up the arguments appearing in the preceding chapters IX. X. Xl, XII, XII. Vt, VII, VIII, IX and X. the chapter on ‘Alamkara’, which is published as an appendix in the third edition, is not included here, introduction’ in the original work has been retained as Author’s Introduction’. In the origal work, the Footnotes have been placed at the bottom of the page. Since the translator has added some more footnotes for the benefit of the English readers, it was thought proper to shift the footnotes to the end of the chapter. The translator’s footnotes have been clearly distinguished by adding (tr.) 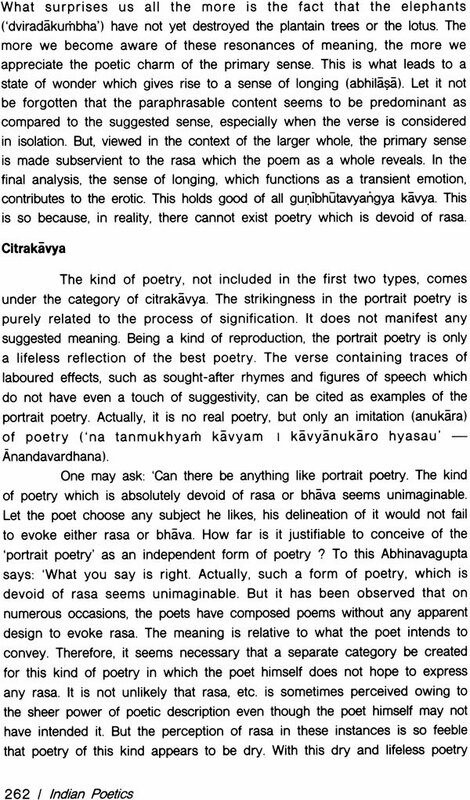 at the end of these notes, While translating some passages I have made use of the author’s book on ‘Abhinavagupta,’ which is published by Sahitya Akademi. 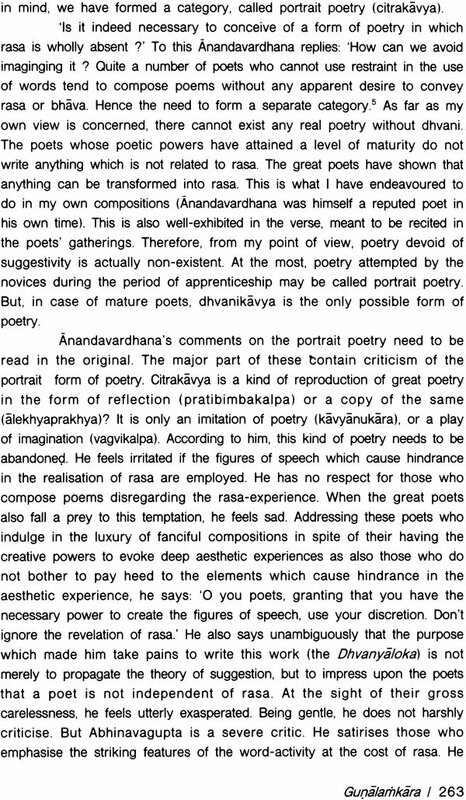 In the first part he argues against the prevailing notions of schools of criticism.’ The evolutionary history of poetics in Sanskrit which he has so meticulously traced is important in so far as it makes us aware of the fact that beneath the diversified approaches, there is an underlying unity in the critical efforts. 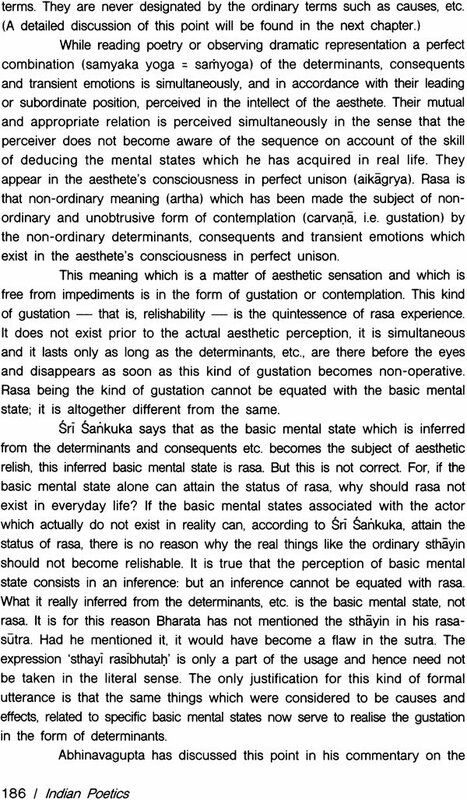 Since the diverse approaches are not mutually exclusive, he infers that there are no ‘schools of criticism’ in the sense that those who emphasise one aspect of aesthetic experience - for instance ‘guna’ or ‘alamkara’ - do not ignore the remaining aspects. To most of them, it is simply a question of priorities. The first part of Dr. Deshpande’s work provides the necessary framework within which the theoretical issues in the second part need to be discussed. Against this backdrop he sets out to explicate the various theories emphasizing the importance of aesthetic experience. In the process, his remarkable critical insights are revealed in the way in which he has provided the much-needed clues where the system seems to be silent. 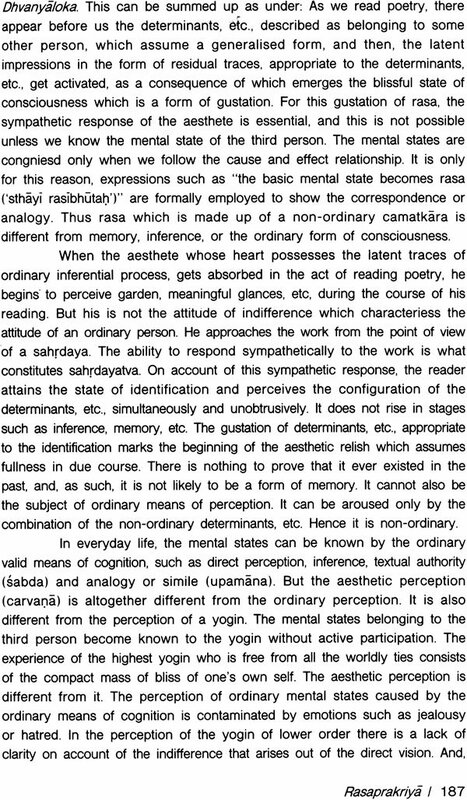 For instance, he warns us against the tendency to misunderstand and misinterpret the critical terms by obliterating the distinction between the aesthetic and psychological categories. 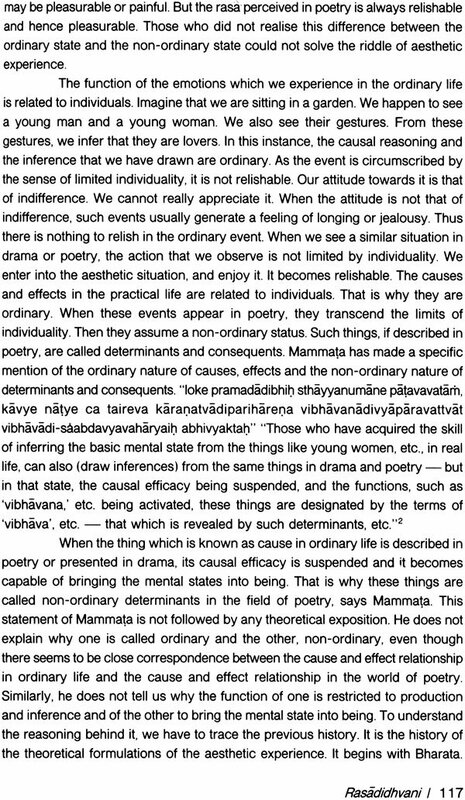 The concept of bhãva, for instance, has an emotional ring about it; but to treat the same as a psychological entity is likely to prove hazardous. Similarly, his threadbare analysis of the conceptual framework reveals that there are two distinct traditions — alaukika’ and ‘alaukika’ — existing almost side by side. His penetrating analysis and interpretation of the ‘alaukika’ tradition is the outstanding feature of this book. An important mark of any good work is that it gives you an impression that you are in the company of a mature and sensitive soul. For the last four months, I was in the company of an excellent scholar who knew what he was about. It will give me satisfaction if my readers experience the fact while going through this translation.